Whether you have ever used a microscope before or not - the Omegon Monovision will thrill you right from the very start. 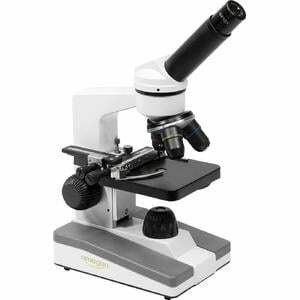 Objective lenses providing an excellent image, a robust mechanism and a solid stage all make the Monovision a superior microscope for both school and hobby use; or simply for fascinating excursions into the world of 'slipper animalcules' (Paramecium), cells and fibres. The Omegon Monovision has the eyepiece tube angled at 45° to make your observing as pleasant as possible. This is very practical - you can observe while relaxed and sitting down, even for long periods. 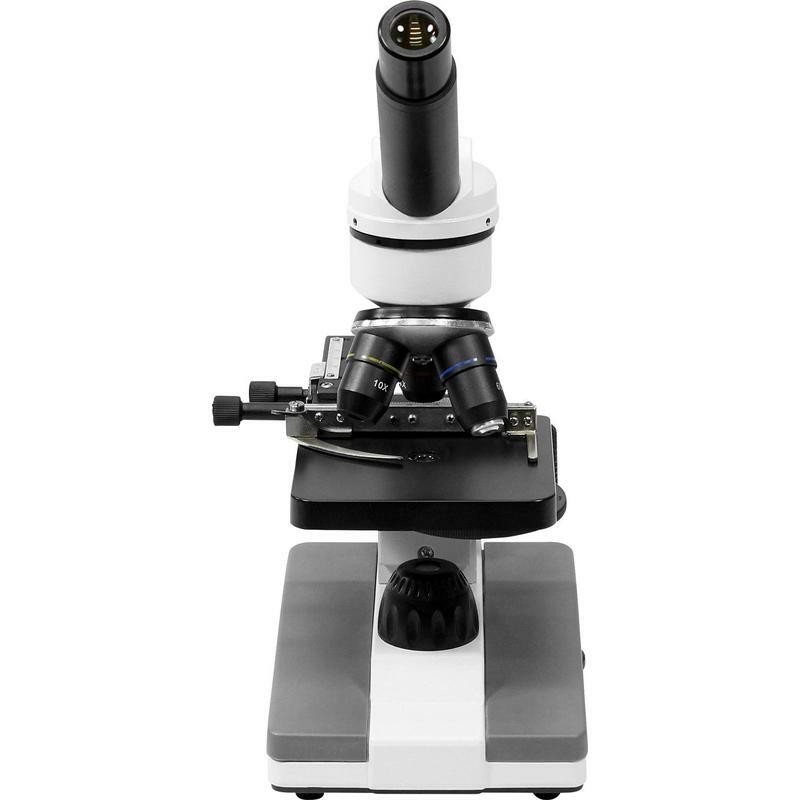 The eyepiece tube can also be rotated by 360° - another advantage for observing convenience. The stage holds your slides, so it is of fundamental importance. 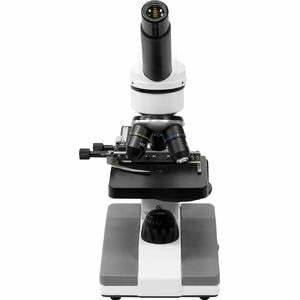 Microscope slides are held by the 'Specimen Buddy', which keeps glass slides held firmly in place and at the right orientation for observing. Changing slides is very simple - the spring-loaded stage clip lets you replace a slide in no time. Stage adjustment controls on both axes (up/down, left/right) allow objects to be accurately positioned, so you can always find the most interesting parts of the specimen - even at high magnifications. 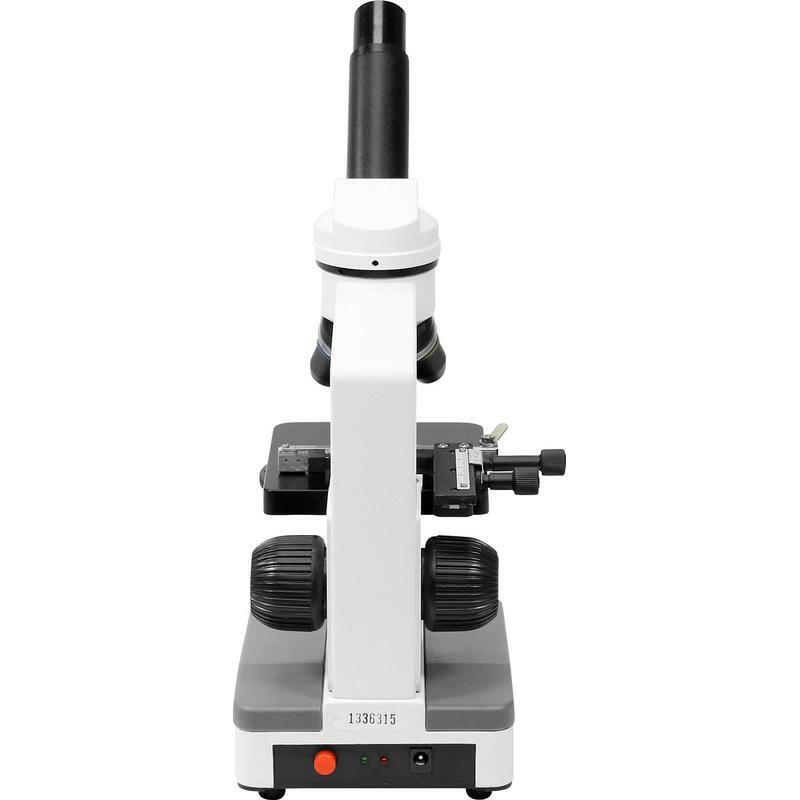 Two eyepieces (10X and 16X) and four different lenses on the objective lens turret allow you to select magnifications from between 40X and 640X - these are sensible magnifications for a microscope of this class and you will always benefit from a clear, high-contrast image. And if it needs to be even higher, then just use the Barlow lens for an incredible 1280X magnification. Biological microscopes, such as the Omegon Monovision, use light that shines up from below. 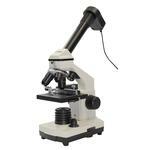 It is a 'bright field' transmitted light microscope and perfect for most observing. And to make your trip into the microcosm a real pleasure, the Monovision comes equipped with bright LED lighting which is adjustable to let you choose the right level of brightness. This microscope is also portable and independent thanks to the built-in battery. Take the Monovision with you outdoors, where you will find thousands of interesting objects to observe. The rechargeable battery can be charged via the mains adapter. Wouldn't it be great to be able to take a photo or video of your specimens? This is exactly what the PC eyepiece allows you to do. Install the included software on your computer and insert the camera eyepiece instead of a normal one, and you will then be able to send large images of these minute objects to your PC screen. 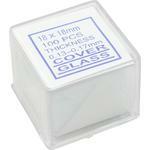 The PC eyepiece is also ideal for groups, school classes or demonstrations. The Omegon Monovision comes in a sturdy transport case. 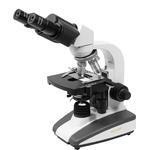 The interior is well padded with foam, with form-fitting spaces for the microscope and included accessories. 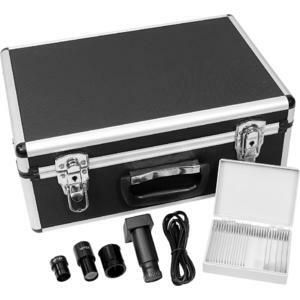 In addition, you will find a power supply, a small plastic box with 5 prepared slides and 15 blank slides. You can get started immediately and get your first impressions of the microcosm - and later enjoy a new photo album on the PC to remind you of your first forays into this mysterious world.